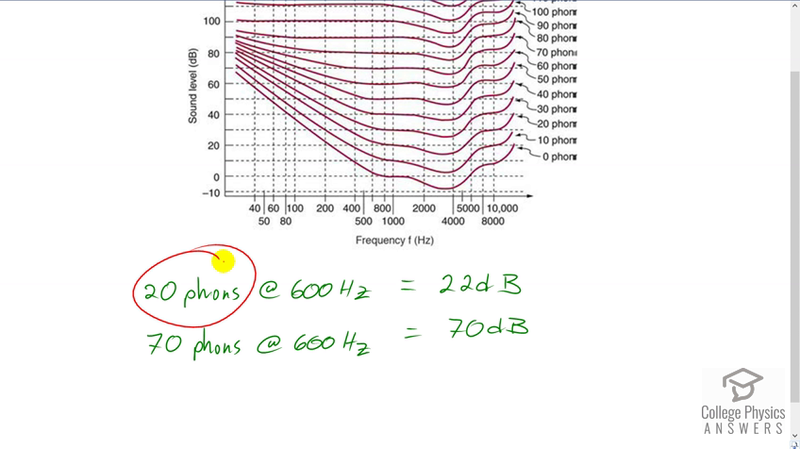 What is the approximate sound intensity level in decibels of a 600-Hz tone if it has a loudness of 20 phons? If it has a loudness of 70 phons? This is College Physics Answers with Shaun Dychko. We are asked to find the sound level in decibels for a sound with a loudness of 20 phons when it has a frequency of 600 hertz. So, lets find 600 hertz on this graph, here is 500 and 600 will be somewhere between five and eight, maybe around here, say… and then we move up to the 20 phons lines which is this one, maybe I can highlight that with a different colour, this is a 20 phons lines and so 600 hertz up to here means that we read off the vertical axis is about 22 decibels for a 600 hertz sound with a loudness of 20 phons and then if that same sound has loudness of 70 phons, lets find the 70 phons line, that is, this one here, then 600 hertz would correspond to about 70 decibels.